The feverish excitement and discovery of the 1920s – and their worse costs in human terms – are suggested in the small exhibition of paintings by Yun Gee at the Oakland Museum through April 27. Gee’s was a tragic career. Born in a small town near Canton in 1906, he was brought up in a traditional Chinese family and studied traditional watercolor painting. In 1921, however, his father brought him to the United States, where he settled in San Francisco’s Chinatown. He studied painting in 1925 at the California School of Fine Arts (now the San Francisco Art Institute) working with Otis Oldfield, who introduced him to modern art, especially color abstraction. The next year he burned all his early paintings and took up modern techniques and esthetics. A gallery show introduced him to patrons who bought work and encouraged him to go to Paris. There, in 1927, he met a number of artists and writers and began to exhibit successfully. He married there in 1930, but returned to this country as the Depression worsened. he was unable to support himself and his young wife, whose own family had cut her off following the marriage; hard times in this country made it impossible to send for her, and they divorced in 1932. American art was swinging in a reactionary direction and it became more difficult for Gee to sell. A mural commissioned fin 1933 by a Bronx Lutheran Church received favorable notices but was taken down for being “too modern.” An alarming mental depression caused him to give up painting for two years. Somehow he returned to Paris in 1936, but the gathering war forced him back to New York within three years. The return to Paris apparently had exposed him to more influences, particularly to more early 20th century art, than he could accommodate: after 1939 his painting began to show signs of a deteriorating concentration. He was very active in the early ’40s, though, with war work as a researcher and illustrator, art teaching for the WPA, and considerable studio activity – as well as a second marriage to the 16-year-old Helen Wimmer. In 1945, the war, the rejection of his work, the increased responsibility of a new baby (and presumably the strain of a “mixed” marriage to so young a wife) culminated in a complete mental breakdown. He remained ill and institutionalized, rarely able to paint, until his death in 1963. 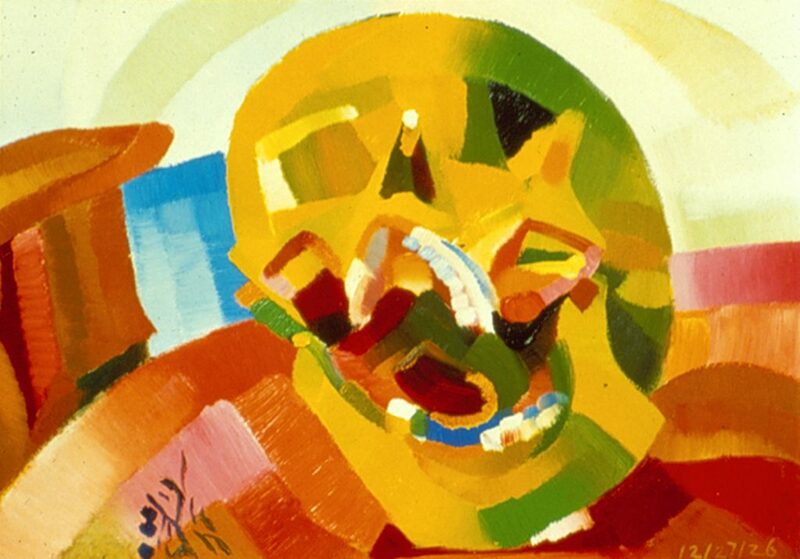 The painting itself, to judge by the Oakland Museum installation, is closely related to the second-generation Paris Cubism of such painters as Robert Delaunay, Roger de la Fresnaye, and Albert Gleizes; the tighter compositions – like the 1926 Skull – suggest Jacques Villon’s faceting technique, too, though his colors are more subtle. Ultimately his composition, like that of the artists just cited, goes back to Cézanne. All this makes Gee sound derivative, and that’s unfair. The second-generation Cubists were themselves rather a weak lot, producing painting which at its best has more decorative appeal than inner strength or interest. Their concerns were sincere, but they fastened on prevailing stylistic approaches to those concerns, not direct analytical solutions of their own. That’s in the nature of an exciting, inventive period of art history. Gee’s painting reflects it. More interestingly, it’s vivacity, strength and directness reflect the open nature of his society, the energy and the political and social optimism prevailed. “Derivation” is the other side of the coin from “community,” and a small price to pay for the comfort and challenge of an active art scene – “bohemianism,” if you like. Those periods come along every now and then: the Cedar Bar abstract expressionist scene in New York in the ’50s, the Beat Generation in San Francisco. Alas, those periods don’t last. Yun Gee’s daughter (by his second wife), a young New York painter named Li-lan, visited her fathers retrospective the other day. Her work is completely different from her father’s. Li-lan’s work – largely oil paintings of notebook pages – is formal, somewhat introspective, very handsome, cool and objective. It speaks as accurately of its time and place as her father’s work did of his. You can’t help drawing conclusions.